Franke Hyland were engaged by a local medical diagnostics company to establish an IP strategy to protect their products both here and overseas. There are many benefits in using home or bedside blood testing over laboratory testing; including safety, decreased error rates and immediate test results. There are also many challenges when developing an approach to this sort of testing. Many firms have tried the “bits in a box” method, which are prone to high error rates. 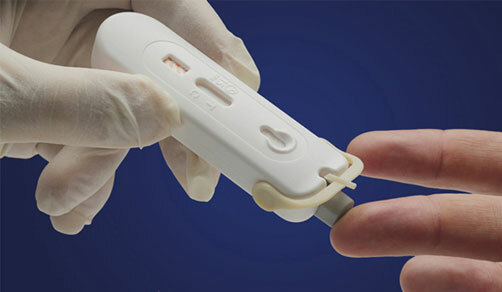 Atomo Diagnostics believe they have cracked this problem with the AtomoRapid™ test platform that integrates the multiple components necessary for performing a rapid blood test, into a simple & easy to use test device. Franke Hyland were able to assist them in the commercialisation of the AtomoRapid™. They wanted to ensure that their innovation would be protected both here and in many places overseas. A review of existing patents and registered designs was undertaken to assist Atomo with a better understanding of their commercial position. Point of Care in-vitro diagnostics is an intensely competitive field and Atomo needed a strategy to develop registered designs and patents for many aspects of their inventions.